Green Bean Salad Recipes - fresh green beans make perfect salads! Green bean salad recipes first and foremost begin with the freshest beans. If not from the farmer's market or your own garden, then from the produce section of your super market - no frozen or canned beans in this salad! First you must cook the green beans, than you can choose one of the simple, yet elegant recipes below. These recipes are some of our printable low glycemic index recipes. Take your fresh beans and trim the ends. Boil a large pot of water with 2 tablespoons of salt. The salt sets the green color and will be washed off when you rinse the beans. Put the beans in the pot when the water is boiling. Cook until just tender crisp which will be in about 5 – 6 minutes. By all means taste them and cook until they are just right which means just a little firm and tender. Drain the beans in a colander and cool immediately with cold water. You can put ice cubes on them to chill them down more quickly. Move to a paper towel to dry. Now they’re ready to use in salads. You can also steam them using the same method only putting the beans in a steamer. You'll retain more nutrients. Mix the vegetables in a salad bowl and add parsley. Mix the rest of the ingredients and shake. Pour it over the vegetables and marinate at least an hour. Take it out of the refrigerator at least 15 minutes before you eat so you can have it at room temperature. This wonderful salad serves 6 but keeps well refrigerated. You can serve it to guests and store the leftover salad to eat during the week. Besides having some protein and lots of fiber, green beans are a rich source of flavonoids! It’s not easy to get enough flavonoids in our diets because the richest sources are in foods you may not eat every day unless you drink green tea. Why do we need them? They are potent antioxidants and protect us from free radicals that cause such devastating disease. Besides having anti-inflammatory effect, the flavonoids are good for diabetics because they have the ability to lower blood sugar. Other great sources of flavonoids are broccoli, kale, cranberries and the peel of citrus. Shake vigorously to blend and pour the dressing over 1 pound of cooked green beans that have been thoroughly chilled. Add finely chopped walnuts to the beans and mix thoroughly. The walnuts give you some omega 3 fats and more protein. You could also substitute a can of drained tuna packed in water for the walnuts. 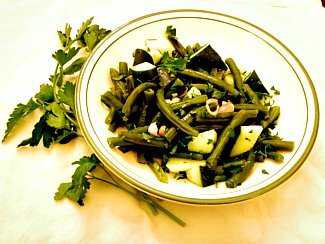 Green bean salad recipes can be created with many different herbs and vegetables. Some good combinations are with tomatoes, onions, olives, red bell pepper, ginger or scallions. They're especially good with marjoram or basil. Buy those that are bright green, smooth and stringless. If you aren't serving them soon, wrap them in a damp paper towel and refrigerate in a plastic bag. If you cook them ahead and store they'll be ready for one of these salad recipes and put together quickly. You can also roast green beans instead of steaming or boiling them. Return from Green Bean Salad Recipes to Low Glycemic Recipes. Return from Green Bean Salad Recipes to Lifetime Fat Loss home page.